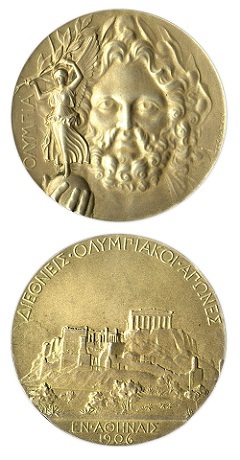 For commemorative Greek stamps, the BIG event of this period was a Special Olympic Games, held in Athens, Greece. This international sporting-event, now referred to as the 1906 Intercalataed Games, celebrated the 10th Anniversary of the First World Olympic Games of the Modern Era, held in Athens, Greece in 1896. In 1906, these games were referred to as the Olympic Games, even by the International Olympic Committee, but they are not recognized, today, as part of the World Olympic Games (Olympiad) that have been held every four years, since 1896. The 2nd World Olympic Games were held in 1900, in Paris, the 3rd World Olympic Games were held in 1904, in St. Louis, and the 4th World Olympic Games were held in 1908, in London. 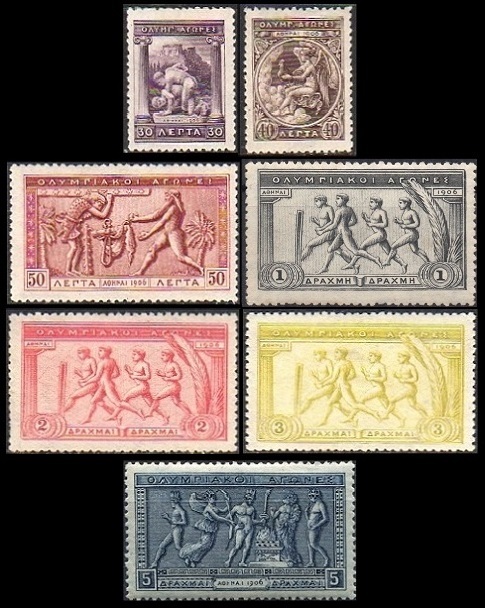 The fourteen commemorative Greek stamps shown above (Sc. #184-197) were issued in March 1906 to celebrate the 10th Anniversary of the First World Olympic Games of the Modern Era in 1896 and to publicize the Intercalataed Olympic Games of 1906. These stamps are engraved on watermarked paper, and they are perforated 13 1/2 or perforated 14. The nine classical Greek designs, as they appear in the set, are as follows. Apollo throwing a discus. Apollo was an Olympian god, the son of Zeus and Hera. He is depicted as an athletic youth. He has been considered the god of music, truth, prophecy, healing, the sun, and poetry. A jumper, with jumping weights. Atlas and Hercules. Atlas was the Titan god, tasked with holding up the sky. Hercules, or Heracles, the mortal son of the Olympian god Zeus, was renowned as the embodiment of strength and endurance. Struggle of Hercules and Antaeus. Hercules won! Daemon (divine being) of the games. Nike (Victory), a priest, and athletes making an offering to Zeus. 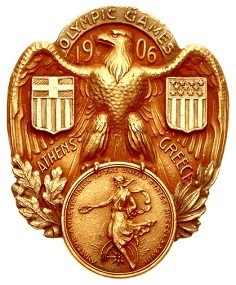 The 1906 Intercalataed Olympic Games were held in Athens, Greece, between April 22 and May 2, 1906. These were the first games to have the Opening Ceremony as a separate event, and this event witnessed the first time that the athletes marched into the stadium as national teams, with each following its national flag. Six thousand school children took part in the first ever closing ceremony. Twenty countries participated in the games. A total of 854 athletes (848 men and 6 women) participated in 78 events. The medal count was led by France, the United States, and Greece. The only participating country that did not win at least one medal was Egypt. 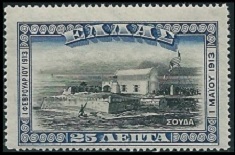 The 25 Lepta denomination commemorative Greek stamp shown above (Sc. #232) was issued on December 1, 1913 to celebrate the Union of Crete and Greece. These stamps were used only in Crete. The design depicts the Raising of the Greek Flag at Suda Bay, Crete. 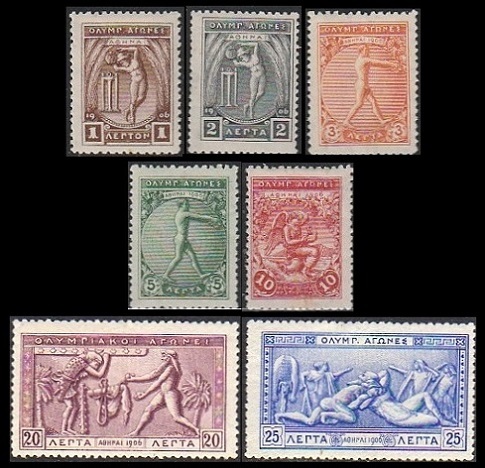 The two pictorial Greek stamps shown above (Sc. 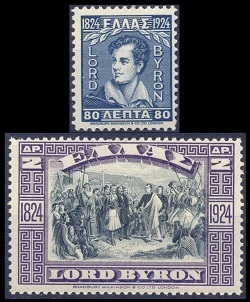 #316-317) were issued on April 16, 1924 to commemorate the 100th Anniversary of the Death of Lord Byron at Missolonghi. The two designs feature a portrait of Lord Byron and a painting of Lord Byron at Missolonghi. George Gordon Byron, the Sixth Baron Byron, called Lord Byron (1788-1824) was a World-renowned British poet, politician, and a leading figure in the Romantic Movement. Later in his life, Byron joined the Greek War of Independence, fighting against the Ottoman Empire. He died from a violent fever, in Missolonghi, on April 16, 1824, while preparing for an attack on the Turkish-held fortress at Lepanto. Lord Byron is considered a national hero in Greece. The 25 Lepta denomination commemorative Greek stamp shown above (Sc. #318) was issued on April 24, 1926 to celebrate the 100th Anniversary of the Defense of Missolonghi, during which the city was under siege by the Ottoman navy. The design features the Tomb of Markos Botsaris. Markos Botsaris (1788-1823) was a Greek general and a hero of the Greek War of Independence. Botsaris led a victorious attack on the Ottoman Army at Karpenisi on August 21, 1823, however he was shot and killed during the battle. He is one of the most revered national heroes in Greece. After three long sieges, Missolonghi was captured by Ottoman forces in April 1826, and Athens was captured by Ottoman forces in August 1826. The atrocities committed by the Ottoman forces against the Greeks were such that the European Powers, favoring an autonomous Greek state, decided to intervene. Great Britain, France, and Russia attacked and destroyed the Ottoman fleet at Naravino in 1827. The Russo-Turkish War of 1828-1829 soon followed. On February 3, 1830, Greece was finally declared an independent monarchy, under European military protection. The Turkish Sultan finally recognized Greek independence, at the Treaty of Constantinople in July 1832.